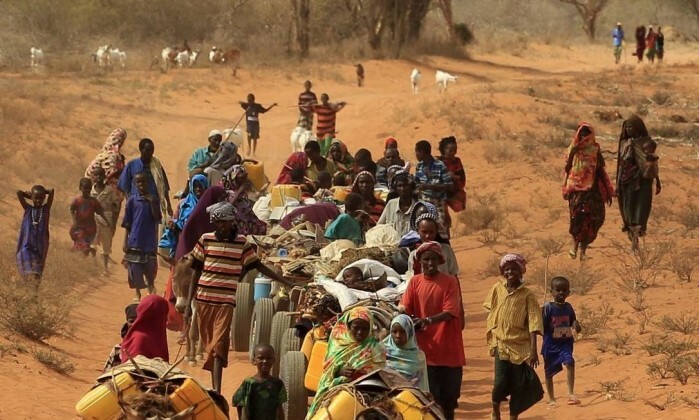 More than 36 million people face hunger across southern and eastern Africa, the United Nations has warned, as swaths of the continent grapple with the worst drought in decades at a time of record high temperatures. The immediate cause of the drought which has crippled countries from Ethiopia to Zimbabwe is one of the strongest El Niño events ever recorded. It has turned normal weather patterns upside down around the globe, climate scientists say. But with the world still reeling from record-high temperatures in February, there are fears that the long-term impacts of climate change are also undermining the region’s ability to endure extremes in weather, leaving huge numbers of people vulnerable to hunger and disease. The worst hit country in the current crisis is Ethiopia, where rains vital to four-fifths of the country’s crops have failed. Unicef has said it is making plans to treat more than 2 million children for malnutrition, and says more than 10 million people will need food aid. “Ethiopia has been hit by a double blow, both from a change to the rainy seasons that have been linked to long-term climate change and now from El Niño, which has potentially led the country to one of the worst droughts in decades,” said Gillian Mellsop, Unicef representative to Ethiopia. The crisis has been damaging even to Ethiopians not at immediate risk of going hungry. It has truncated the education of 3.9 million children and teenagers, who “are unable to access quality education opportunities because of the drought”, she said. Neighbouring countries grappling with hunger after crops failed include Somalia, Sudan and Kenya, and altogether the failed rains have left more than 20 million people “food insecure” in the region. The drought caught many officials by surprise, because although El Niño was forecast, the weather event normally brings more rain to the region, not less. “The typical pattern that you would expect with El Niño is very dry weather in southern Africa, but slightly wetter than normal in eastern Africa,” said Dr Linda Hirons, a research scientist at the National Centre for Atmospheric Science. In southern Africa, the drought caused by El Niño was expected, but it has been even more severe than feared, with rains failing two years in a row. Overall nearly 16 million people in southern Africa are already going hungry, and that number could rise fast. “More than 40 million rural and 9 million poor urban people are at risk due to the impacts of El Niño’s related drought and erratic rainfall,” the World Food Programme has warned. Zimbabwe, once the region’s bread basket, is one of the worst hit countries. In February, the country’s president Robert Mugabe declared a state of disaster due to the drought, and in less than a month official estimates of people needing food aid has risen from 3 million to 4 million. Neighbouring countries are also scrambling to find food aid, including South Africa, whose ports are the main entry point for relief across the region. More than a third of households are now going hungry, he said. Families that used to eat two meals a day are cutting back to one, and those who could once provide a single meal for their dependents are now entirely reliant on food aid, he said. Beyond the immediate scramble to get food to those who need it, aid workers in the region say the drought has served as reminder that communities vulnerable to changing weather patterns need longer-term help adapting. “It’s becoming common knowledge now that we will experience droughts much more,” said Beatrice Mwangi, resilience and livelihoods director, southern Africa region, World Vision, who said she is focused on medium- and long-term responses. “In the past it was one big drought every 10 years, then it came to one drought every five years, and now the trends are showing that it will be one every three to five years. So we are in a crisis alright, that is true. This article was amended on 17 March 2016 to remove a picture because it was an inaccurate illustration of the theme of the article and contained ambiguities in the caption. Severe droughts and floods triggered by one of the strongest El Niño weather events ever recorded have left nearly 100 million people in southern Africa, Asia and Latin America facing food and water shortages and vulnerable to diseases including Zika, UN bodies, international aid agencies and governments have said. New figures from the UN’s World Food Programme say 40 million people in rural areas and 9 million in urban centres who live in the drought-affected parts of Zimbabwe, Mozambique, South Africa, Zambia, Malawi and Swaziland will need food assistance in the next year. In addition, 10 million people are said by the UN’s Office for the Coordination of Humanitarian Affairs (Ocha) to need food in Ethiopia (pdf), and 2.8 million need assistance in Guatemala and Honduras. Millions more people in Asia and the Pacific regions have already been affected by heatwaves, water shortages and forest fires since El Niño conditions started in mid-2015, says Ocha in a new briefing paper, which forecasts that harvests will continue to be affected worldwide throughout 2016. “Almost 1 million children are in need of treatment for severe acute malnutrition in eastern and southern Africa. 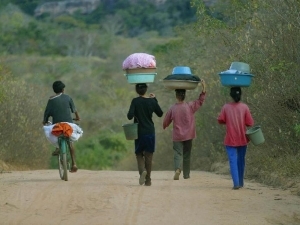 Two years of erratic rain and drought have combined with one of the most powerful El Niño events in 50 years to wreak havoc on the lives of the most vulnerable children,” said Leila Gharagozloo-Pakkala, southern Africa regional director of the UN children’s agency, Unicef. According to the World Health Organisation, the heavy rains expected from El Niño in Peru, Ecuador, Paraguay and southern Brazil could increase the spread of the Zika virus. “The Aedes aegypti mosquito breeds in standing water. We could expect more mosquito vectors which can spread Zika virus because of expanding and favourable breeding sites [in El Niño-affected countries],” the organisation said. El Niño conditions, which stem from a natural warming of Pacific Ocean waters, lead to droughts, floods and more frequent cyclones across the world every few years. This year’s event is said by meteorologists to be the worst in 35 years and is now peaking. Although it is expected to decline in strength over the next six months, its effects on farming, health and livelihoods in developing countries could last two years or more because of failed harvests and prolonged flooding. “Insufficient rains since March 2015 have resulted in drought conditions. In Central America, El Niño conditions have led to a second consecutive year of drought – one of the region’s most severe in history,” said an Ocha spokesman. Zimbabwe, which declared a national emergency this month, has seen harvests devastated and food prices soar, according to the WFP in Harare. It reports that food production has halved compared to last year and maize is 53% more expensive. It expects to need nearly $1.6bn in aid to help pay for grain and other food after the drought. Malawi is experiencing its first maize deficit in a decade, pushing the price 73% higher than the December 2015 average. In Mozambique, prices were 50% higher than last year. The country depends on food imports from South Africa and Zimbabwe, and faces a disaster if rains do not arrive in the next few weeks, said Balde. Fears are also growing that international donors have been preoccupied by Syriaand the Ebola crisis, and have not responded to food aid requests from affected countries. “El Niño began wreaking havoc last year. The government has done its best to tackle the resultant drought on its own, by tapping into the national food reserves and allocating more than $300m [£210m] to buy wheat in the international market,” said Ethiopian foreign minister Tedros Ghebreyesus. “But the number of people in need of food assistance has risen very quickly, making it difficult for Ethiopia to cope alone. For the 10.2 million people in need of aid, requirements stood at $1.4bn. The Ethiopian government has so far spent $300m and a similar sum has been pledged by donors. The gap is about $800m,” he said. According to the Famine Early Warning Systems Network, set up by the US international development agency, USAID, in 1985, continued below-average rainfall and high temperatures are likely to persist in southern African well into 2016, with the food crisis lasting into 2017. Guaribas (PI) – Lançado no dia 3 de fevereiro de 2003, no município com o menor Índice de Desenvolvimento Humano (IDH) do país, o Programa Fome Zero foi criado com o objetivo de erradicar a miséria, com a transferência de renda e garantindo o alimento para as famílias que viviam na extrema pobreza. Hoje, o Brasil ainda tem pelo menos 5,3 milhões de pessoas sobrevivendo com menos de R$ 70 por mês, diferentemente do início dos anos 2000, quando eram 28 milhões de pessoas abaixo da linha da pobreza. Nos último dez anos, esse número vem diminuindo. Em parte, por causa de políticas públicas de ampliação do trabalho formal, do apoio à agricultura e da transferência de renda. Hoje, a iniciativa, que ganhou o nome de Bolsa Família, chega a quase 14 milhões de lares. Ela nasceu do Programa Fome Zero, criado para garantir no mínimo três refeições por dia a todos os brasileiros. E foi do interior do Nordeste que essa iniciativa partiu para o restante do país. Depois de dez anos, a Agência Brasil voltou a Guaribas, no sul do Piauí, escolhida como a primeira beneficiária do programa de transferência de renda. Localizada a 600 quilômetros ao sul da capital, Teresina, Guaribas não oferecia condições básicas para uma vida digna de sua população: faltava comida no prato das famílias, que, na maioria das vezes, só tinham feijão para comer. Não havia rede elétrica e poucas casas tinham fogão a gás. Mulheres e crianças andavam quilômetros para conseguir um pouco de água e essa busca, às vezes, durava o dia inteiro. A dona de casa Gilsa Alves lembra que, naquela época, “era difícil encontrar água para lavar roupa”, no período de seca. “Às vezes, até para tomar banho era com dificuldade”. O aposentado Eurípedes Correa da Silva não se esquece daquele tempo, quando chegou a trabalhar até de vigia das poucas fontes que eram verdadeiros tesouros durante os longos períodos de seca, com água racionada. Hoje, a água chega, encanada, à casa dele. Pai de sete filhos, Eurípedes tem televisão e geladeira. Além do dinheiro da lavoura e da aposentadoria, ele recebia o benefício do Fome Zero e agora conta com o Bolsa Família. O benefício chega a 1,5 mil lares e a meta é alcançar 2 mil neste ano, o que representa oito em cada dez moradores da cidade. A coordenadora do programa em Guaribas, Raimunda Correia Maia, diz que “o dinheiro que gira no município, das compras, da sustentação dos filhos, gera desenvolvimento”. A energia elétrica também chegou a Guaribas e trouxe com ela internet e os telefones celulares. No centro da cidade, há uma praça com ruas calçadas e uma delegacia, além de agências bancárias, dos Correios e escolas. A frota de veículos cresceu e, hoje, o que se vê são motos, em vez de jegues. O município conquistou o principal objetivo: acabar com a miséria. Mesmo assim, ainda está entre os mais pobres do país e enfrenta o êxodo dos jovens em busca de emprego em grandes cidades. Segundo o IBGE, entre 2000 e 2007, quase 10% dos moradores deixaram Guaribas. Alan e Rosângela podem ser os próximos. O Bolsa Família e as melhorias na cidade não foram suficientes para manter o casal no município, já que ali os dois não encontram trabalho. Os irmãos já foram para São Paulo e é impossível sustentar a família de oito pessoas com um cartão (do Bolsa Família) de R$ 130. Quem escolheu ficar na cidade sabe que muita coisa tem que melhorar. O esgoto ainda não é tratado; algumas obras não saíram do lugar, como a do mercado municipal. Até o memorial erguido em homenagem ao Fome Zero está abandonado há anos. Longe de Teresina, os moradores se sentem isolados, principalmente por causa da dificuldade de chegar à cidade mais próxima: são 54 quilômetros de estrada de terra, em péssimo estado, até Caracol. Isso torna difícil escoar a produção de feijão e milho e faz com que todos os produtos cheguem mais caros. A dificuldade de acesso também prejudica uma das conquistas da região: a unidade de saúde. A doméstica Betânia Andrade Dias Silva levou o filho de 5 anos para uma consulta e não encontrou médicos. Há mais de um mês, o atendimento é feito apenas por enfermeiras e por um dentista. Mesmo oferecendo um salário que chega a R$ 20 mil, a prefeitura diz que não consegue contratar médicos. O jeito é mandar os pacientes mais graves para as cidades vizinhas.co. Ela desabafa: “É ruim né?! Principalmente numa cidade pequena, na qual você precisa de um atendimento melhor, tem que sair para ir para outra cidade, Caracol, São Raimundo, que fica longe daqui. Por exemplo, caso de urgência, se você estiver à beira da morte, acaba morrendo na estrada… Então, é difícil”. Mas essa situação pode começar a mudar ainda neste ano. Segundo informou a Secretaria de Transportes do Piauí, o trecho da BR-235 que liga Guaribas a Caracol deve começar a ser asfaltado em outubro. Por enquanto, está sendo asfaltado outro trecho da rodovia, entre Gilbués e Santa Filomena. O casal Irineu e Eldiene saiu de Guaribas para procurar trabalho em outras cidades, mas voltou. Agora eles levantam, pouco a pouco, uma pousada no centro da cidade. Irineu diz que a obra que está fazendo não é “nem tanto pensando no agora”, é para o futuro. “Estou vendo que a cada ano que está passando, Guaribas está desenvolvendo mais”. 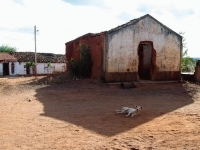 A expectativa de Irineu e Edilene é resultado da mudança dessa que já foi a cidade mais pobre do país. Mesmo com dificuldades, os moradores de Guaribas, agora, olham para o futuro com mais esperança e otimismo. Eldiene garante que vai ficar e ver a pousada cheia de clientes. Veja aqui galeria de fotos de Guaribas na época do laçamento do Fome Zero. Para Ana Paula, Glauber Rocha tem estilo similar ao de Artaud, por vincular a escrita ao traço pictórico e reinventar a gramática. “Você tem fome de quê?”. A música Comida, da banda Titãs, já colocava há algum tempo o questionamento sobre as inúmeras fomes que sentimos, que vão desde o desejo de consumir arte à necessidade da própria comida. Porém, é a abordagem do sentido literal da palavra que dá forma a um encontro que parecia improvável: entre os escritores brasileiros Josué de Castro e Graciliano Ramos, o cineasta Glauber Rocha e o poeta, ator e diretor teatral francês Antonin Artaud. O projeto “O corpo extremo: da escrita limite ao limite da escrita”, desenvolvido pela professora Ana Paula Veiga Kiffer, da Pontifícia Universidade Católica (PUC-Rio), analisa a questão da fome e da loucura de Antonin Artaud, usando como referência a fundamentação crítica e teórica dos três autores brasileiros. movimento conhecido como mangue beat. Apesar de não ser mais um assunto discutido na intelectualidade, a literatura sobre a fome, no Brasil, gerou frutos que rendem até hoje. Um grande exemplo vem do escritor e médico Josué de Castro. Uma de suas principais obras e seu único romance, Homens e Caranguejos, publicado em 1967, influenciou, quase trinta anos mais tarde, a formulação do movimento musical mangue beat, liderado por Chico Science e Fred Zero Quatro, na década de 1990, em Recife. Se Josué de Castro compara os homens, catadores de caranguejo, aos próprios crustáceos, ambos famintos e mergulhados na lama, Chico Science fala do mangue e sua sociedade marginal de homens-caranguejo, juntando na mesma panela musical, funk, hip hop e influências regionais. Também a experiência do francês Artaud, durante o período em que ficou internado, tanto no asilo de Rodez quanto em Ivry-Sur-Seine, na França, foi registrada, de forma original e única, em cadernos escolares. “Nestes cadernos, podemos perceber a materialização da fome vivida, que transforma essa experiência em um discurso que traz um novo modo de dizer, que parece tratar a linguagem como algo concreto e material.” Para Ana Paula, a discussão sobre a fome deve ser retomada sob outro ângulo, encarando-a e a outros problemas da nossa sociedade, mas substituindo a vitimização pela superação.